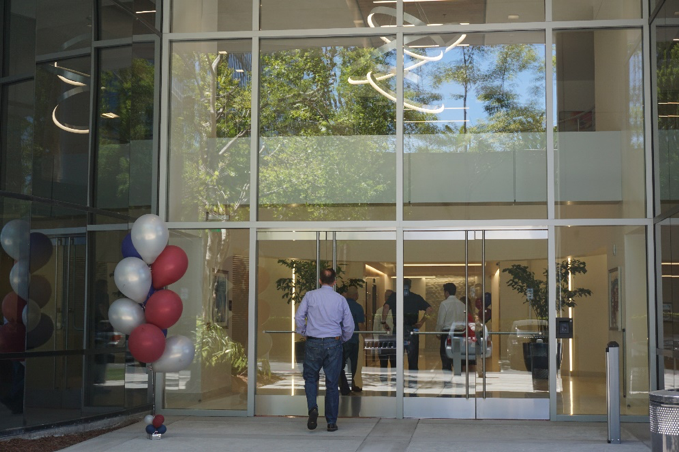 Recently, San Jose-based Briggs Development hosted an open house for more than 150 commercial real estate brokers at 100 Century Center Court in San Jose, unveiling the newly-renovated office building and showcasing its updated 8 th floor. “The Briggs team did an excellent in job transforming a building that was familiar into something that really stands out. The contemporary lobby, clean interiors, and great views should make the 8th floor an exciting home for some tenant in the near future,” said Matt Von der Ahe, a Senior Vice President at CBRE. The newly-renovated top floor boasts a new market-ready open layout with 9 private offices, 5 conference rooms, and an open collaborative kitchen. New tenants also have access to a new on-site fitness center and the opportunity to utilize building-top signage. Built in 1986 and acquired by Briggs in 2016, this 8-story office property offers up to 14,025 square feet of available space within walking distance to local restaurants and hotels, and just one mile from Norman Y. Mineta International airport. Briggs Development is a privately owned real estate development firm focused on adding value to commercial real estate assets throughout Northern California. Briggs seeks opportunities to reposition existing commercial properties or change use through ground-up development. The respected San Jose-based firm is an experienced operator with its leadership enjoying more than a decade of delivering attractive returns on a risk adjusted basis. Briggs co-invests with private and institutional equity partners. Learn more at briggsdev.com.